The three networks have, thus far, ignored the revelation that American taxpayers will only recover a mere $24 million of the $527 million lost on Solyndra, a new report by the Dow Jones newswire revealed last week. The evening newscasts and morning shows have skipped the announcement. The Washington Examiner explained on Thursday, "In a little-noticed move, Solyndra LLC officially released it bankruptcy plan this week. The official word from it is that taxpayers will recover only $24 million of the about $527 million." The only utterance of Solyndra last week came when Republican National Committee Chairman Reince Priebus brought it up on Sunday's This Week. Talking to an unhappy-looking George Stephanopoulos, the RNC chairman zinged, "The entire philosophy of...Barack Obama can be summarized in one word and that's Solyndra. That's Barack Obama's philosophy." The Examiner piece quoted the Dow newswire as pointing out that "documents filed Friday evening in a Delaware bankruptcy court say private equity firms, including one whose chief has ties to the Obama administration, will get back at least half of the $70 million they put into Solyndra early last year as the company battled for survival." As the Examiner's Sean Higgins reminded, "US taxpayers, on the other hand, won’t be so lucky." U.S. taxpayers will lose 95.5 percent of their investment, but Obama-connected investigators will get back "at least half." Imagine how the media would react if the situation was reversed and this were true of a Republican president and his or her wealthy donors. 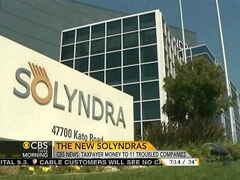 that the three broadcast networks are providing virtually no coverage of the Solyndra scandal, a solar energy firm that went bankrupt after getting more than $500 million in taxpayer money from the Obama administration. This is not the approach the networks took after the collapse of Enron, an energy company with Republican ties. In just the first two months of 2002, the ABC, CBS and NBC evening newscasts cranked out 198 stories on the Enron debacle, compared to just eight so far on Solyndra, a 24-to-1 disparity.